Custom Painting Part IV, the final chapter – I hope! The painting I have completed on the Jeep Wrangler has been some of the most rewarding time spent. For a relatively small amount of money, painting lets your creativity loose and allows you to make your Jeep different from all others. Painting is also extremely tedious and requires your lungs to take a beating from the fumes. I think I am ready for these projects to be the last of the painting for a while. 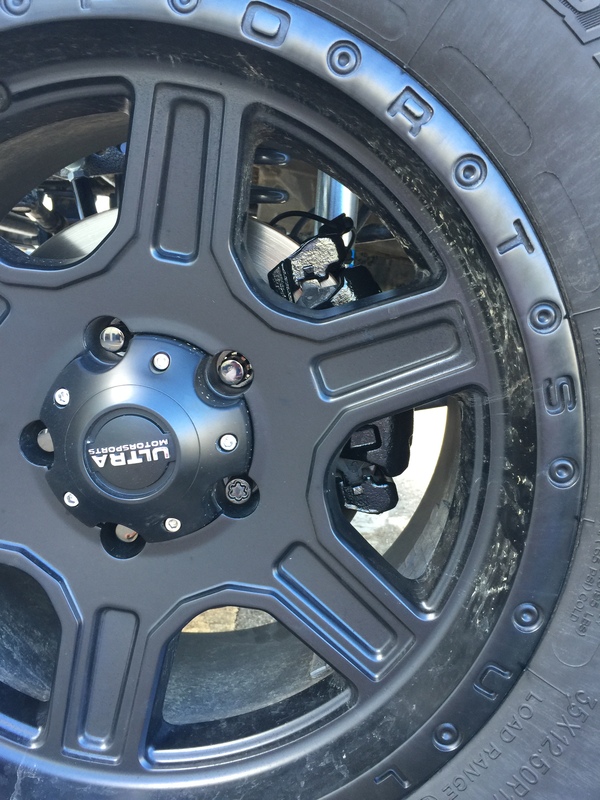 Ever since we VHTed (yes, we have made it a verb) the underside of the Jeep, we have discovered “the more black the better”. 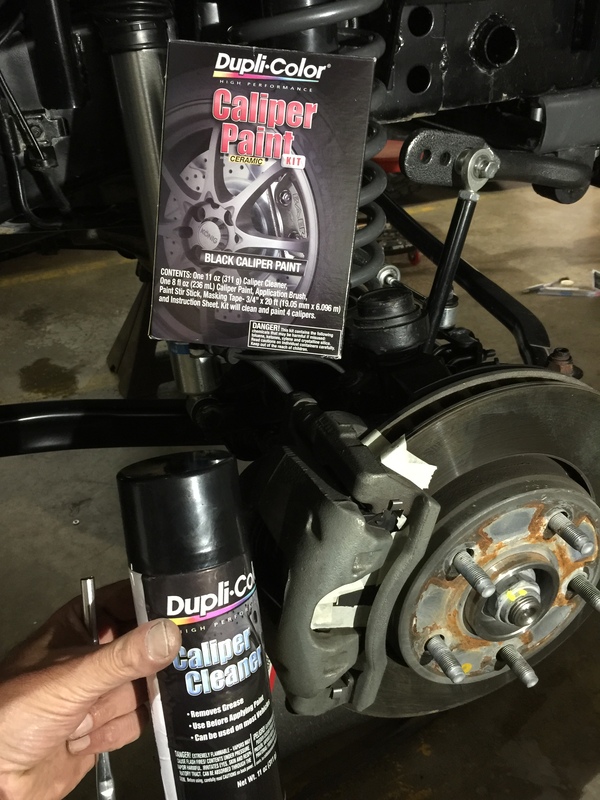 I have wanted to try caliper painting, so I decided to give it a try here with the Dupli-Color Black Caliper Paint Kit. By the way, VHT and Dupli-Color are part of my home town company, Cleveland-based Sherwin Williams – that makes total sense! The kit comes with an aerosol can of caliper cleaner which is best worked in with a tooth brush and then wiped off with a rag. The kit suggests to remove the brake pads for best results, but I decided to leave them on during the painting process. I used the provided masking tape to cover the area of the brake pads and rotors that came in direct contact with the calipers. The caliper paint is applied using the provided small brush. I ended up applying 4-5 coats to the calipers. 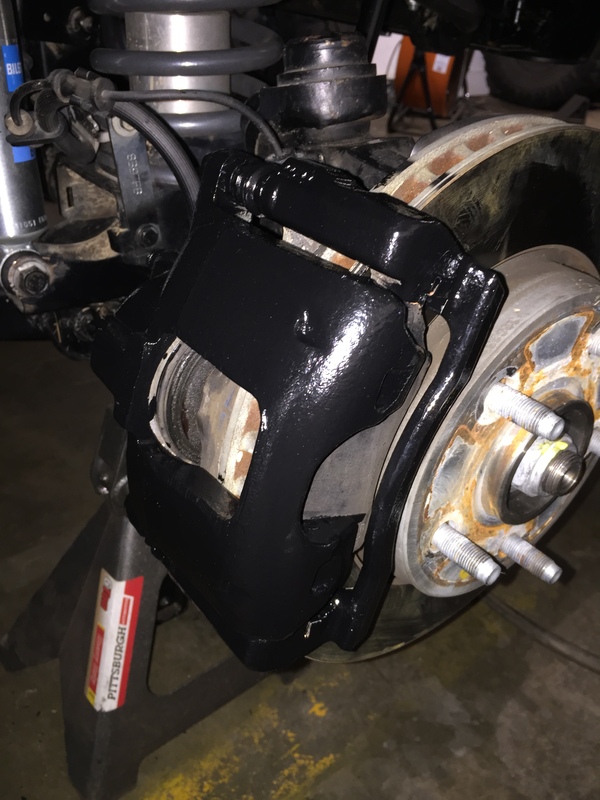 Once I was a little ways into the painting, I realized that I had more than enough paint for the job, so I painted the entire caliper assembly, not just the sides that were outward facing. Even after my liberal painting, I probably used only about 25% of the paint, meaning I probably have enough to do our other family vehicles…hmmm. I was expecting a satin black finish because Dupli-Color also had a gloss black kit in the store as well. I would say, however, that the finish ended up being closer to gloss black than anything else. The view through the wheel showed this black to work just fine. I was not happy with the first time through on painting the shackles. The process of sliding the pins through the bumper guides and screwing them into the shackles pretty much destroyed their paint job. The amount of pressure necessary to screw in the pins twisted the paint right of the thumbscrews. 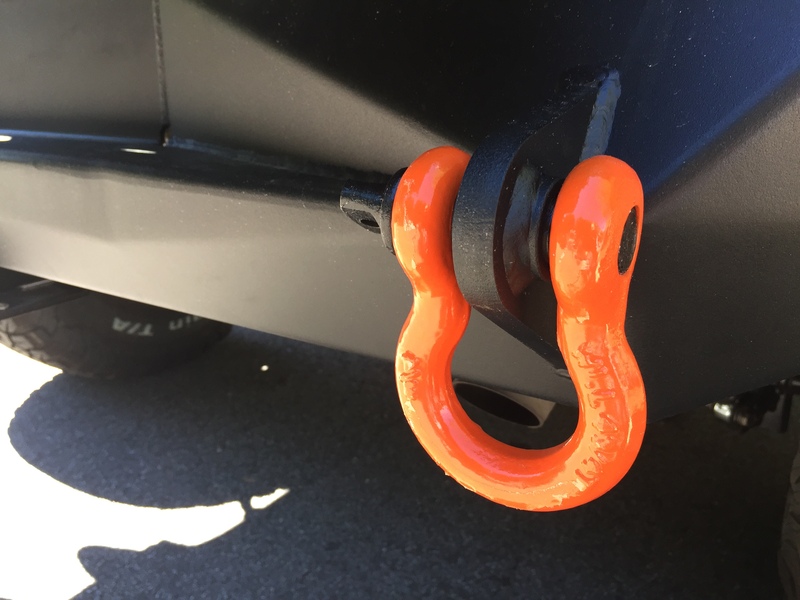 Powder coating is still not a solution for these parts as we need to match our specific Rightline Gear orange color (custom powder coat colors require a significant amount of paint to be produced and proved too costly). 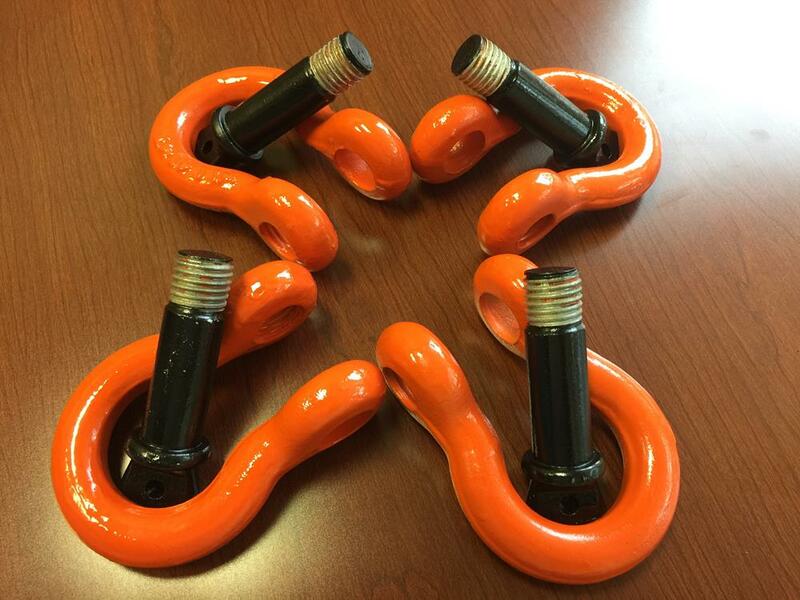 The shackles had clear coat drip marks at their bottom sides from where they were hanging during the coating process. 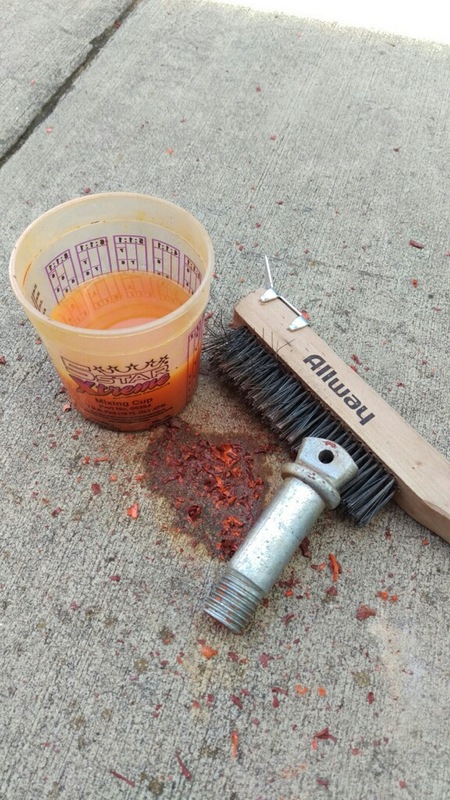 We decided to start completely over and first gave the shackle pins a paint thinner bath. We taped the threads this time and sprayed the pins with our old stand by, VHT Epoxy. Then, we sanded down the trouble spots on the shackles, repainted, and clear coated, this time laying them flat on a surface instead of hanging them by wires. As you can see, everything came out great. The tolerance for the pins to go through the OR-Fab bumpers is very tight. Unfortunately, some of the black paint on the pins’ shafts got rubbed off again, but overall, they fared much better this time. 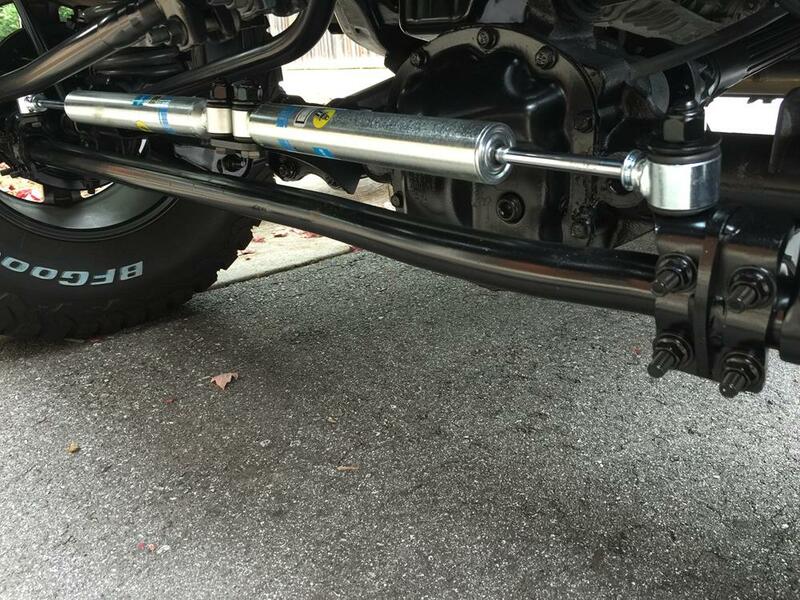 To finish things off, we will touch up the pins’ shafts with a paint brush while still on the Jeep. 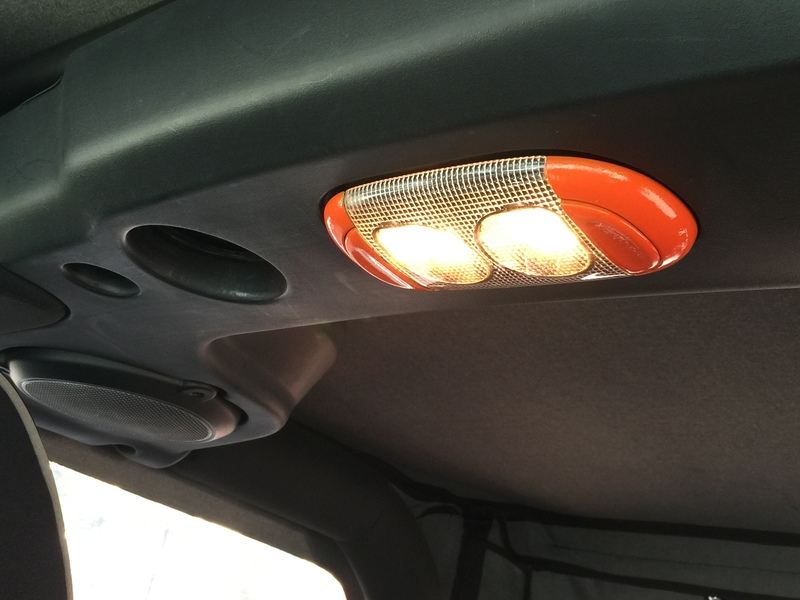 I also decided to paint the dome light inside the Jeep. I popped off the clear plastic lens, unscrewed the torx bolt, and unplugged the wiring from the back side to remove the light. I taped over the clear lens and went about our plastic painting process as described in Custom Painting Part 2. 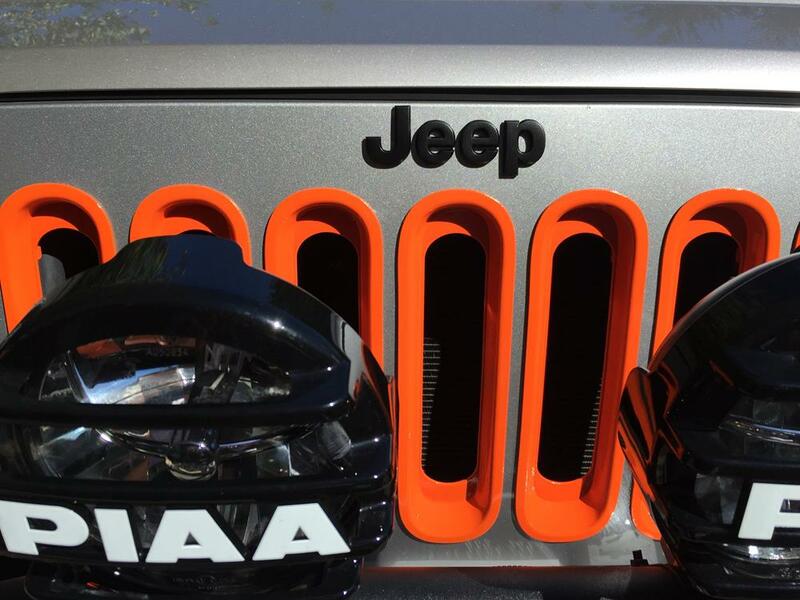 With so many orange parts on the dash of the Jeep, this part provided some orange balance further back – pretty cool! 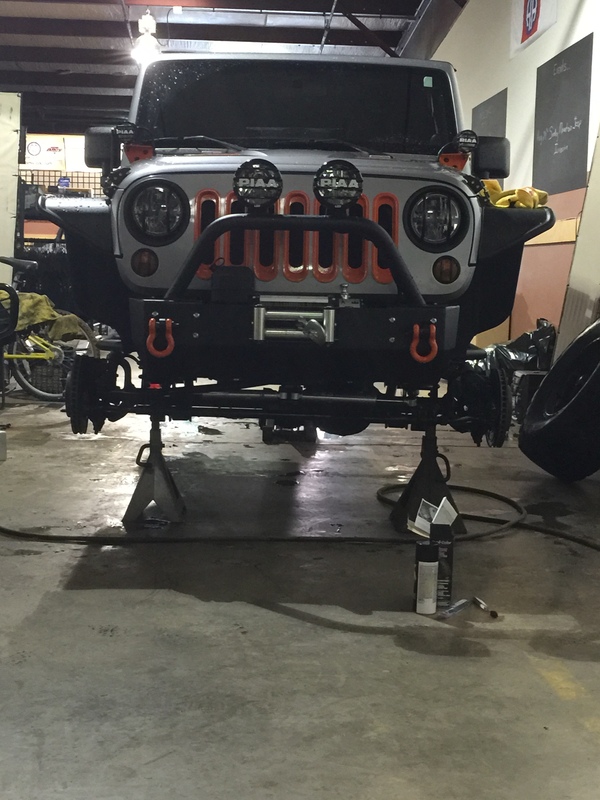 As described above, “the more black the better” has worked for this Jeep Build. After VHTing the first time, we found even more places it would work. Victor taped up the parts of the underside that we needed to protect and went at it again with the VHT Epoxy. He got the front shock housings and the domes on top of the coils. He got the silver body areas inside of the front fenders and the end link relocation tabs. 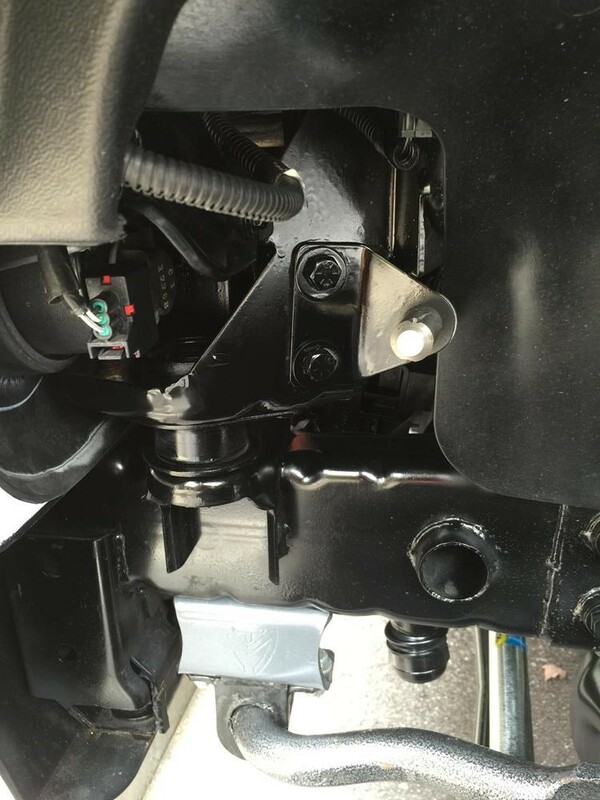 He also hit the mounting hardware for the FORTEC/Bilstein steering stabilizer. These additions definitely blackened things up! I also replaced the stock chrome Jeep logo with an aftermarket black one. A hair dryer loosened the adhesive of the original logo. 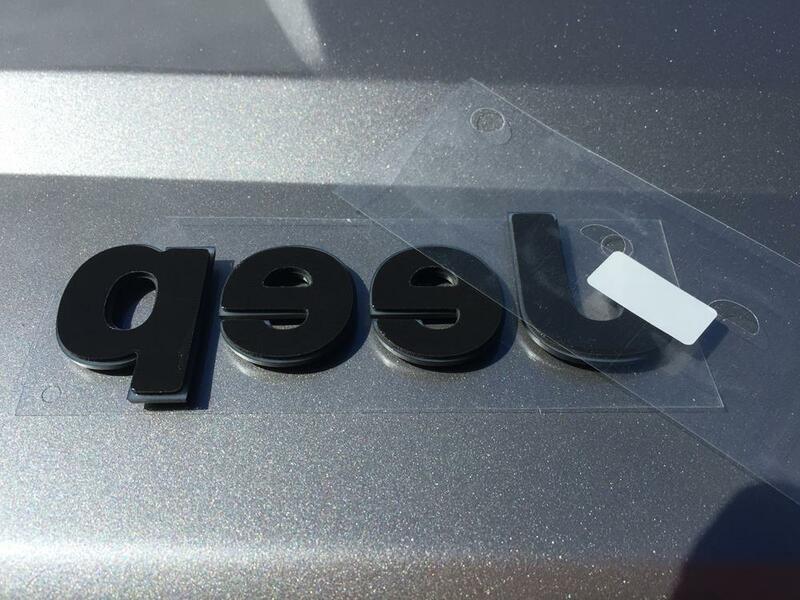 The new black logo came with the same lock down adhesive on its rear side. 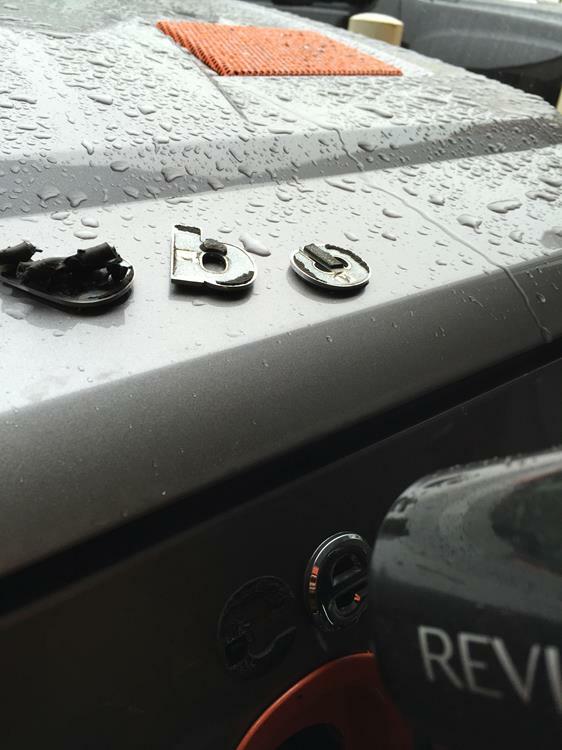 The logo has a matte black finish which will perfectly match the graphics of the Jeep. 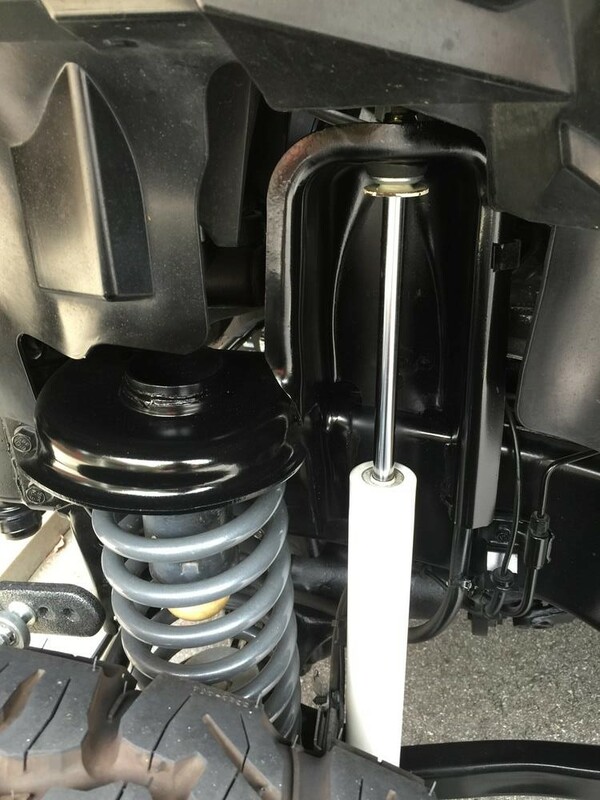 With Custom Painting Part 4 under our belts, our lungs can take a break and we can move on to the final steps of the Rightline Gear Jeep Build.